f. m. davidson : riding old ocean's waves, 1918. Volume 59 Number ?, July 1918. WHEN I arrived at Honolulu, Hawaii, my intentions were.to remain two months. Having become enamored of the sport of surf-board riding, I remained two years, a devotee to this, the most exhilarating and exciting sport in the world. I was, fortunately, the protégé of David - “Dad" - Center, the captain of the famous Outrigger Club. He and Duke Kahanamoku are the champion surf-riders of Hawaii. Could anything be more glorious on a bright, sunny day than to lie out on one’s surf-board, gazing mauka (towards the mountains); the tropical scene reminding one of an exquisite water color painting. The sparkle of the brilliant sunshine on the ocean which has all the colors of the abalone shell, forms a wonderous setting for the white-crested surf, which breaks and races shoreward at a terriﬁc speed, like big, spirited white chargers. On these the surf-riders are seen merrily riding, some standing with jaunty conﬁdence, some few hilariously riding their boards, standing on their heads, the rest content to ride kneeling or “belly-bumper" style, much like kiddies coasting in on their sleds. Truly, this is a playground and sport ﬁt for the gods. The art of surf-board riding originated among the Hawaiians. This race is well known for its superb physical development. Much of this development they owe to their love of surf-riding and swimming. The Hawaiians tell stories of the old days when the famous riders of Niihau used to come over from their island with their pap hi nalu (wave sliding boards) to compete with the big, powerful and skilled riders of Oahu. At these contests wonderful feats were performed. These royal sons of Neptune frequently used boards over fourteen feet long. These were stained black with kukui nut oil, which take a ﬁne polish and were kept wrapped in kapa cloth when not in use. Many of these old boards can be seen in the Bishop's Museum at Honolulu. 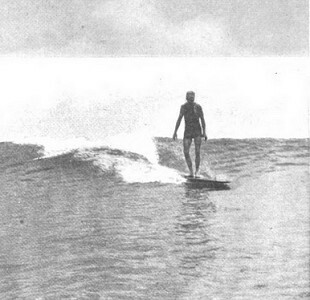 The earliest known of surf-riding is a mele or chant sung of Mamala, the famous surf-rider. She was a shark-goddess, who had the power to change from a beautiful woman into a shark. or vice versa. Mamala loved best to ride after a big Kona storm, when the combers ran fast and furiously towards shore; then, as tradition has it, she was often seen dancing merrily on her surf-board, her nut-brown body glistening through the ﬁlmy white cloud of spray which enveloped her. 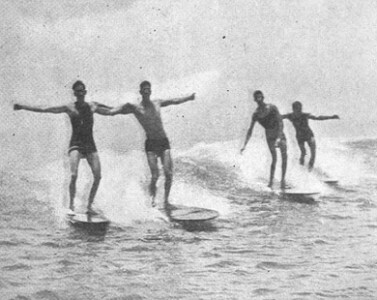 SURF-BOARD riding had been the most popular native sport among the Hawaiians until this generation; for some years interest in it had died down until George Freeth. returning to his native islands, decided to revive the old game which he did with his usual vim and spirit. The Hawaiian boys were lords of this sport until in the last few years the haole boys and men have become enthusiastic experts. 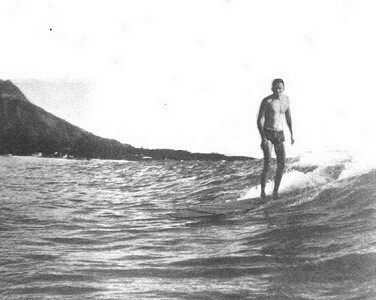 At Honolulu it is possible for the experts to go out with their boards one-half mile or more and ride on the steep face of a wave all the way into shore at the rate of thirty-ﬁve miles an hour. Sometimes a rider and board become separated; the board seems his best friend, but a very distant one. book, “The Cruise of the Snark"- (ChapterVI) - then get a board and enjoy this royal sport. In the last year surf-board riding has become quite a fad at Honolulu. Everybody is doing it, or trying to. Few are experts, as it takes a lone time and much experience to really master this difficult art. Still, it is great fun and splendid exercise learning how. Over at Hawaii, old Father Neptune smiles kindly on these, his favorite isles. There in the waters in front of the Outrigger Club, a merry throng daily enjoys the warmth and tonic effect of these wonderful waters. *Kapa is the correct word for the cloth made by the natives of Hawaii (not tapa); there in no T in the Hawaiian language. Tapa is made in one of the other South Sea Islands. little kiddies taking their ﬁrst lessons in surf-board riding. While learning how to balance and paddle the boards their assistants laugh with joyous derision, as the would-be surfers helplessly wabble about on their boards; until at last they have learned how. It is fun to watch a fat, elderly man with a big “opu” struggling helplessly on his wet, slippery and unruly board, “learning how." After a little practice on the small Cornucopia Surf, near the raft, these novices soon venture out into the big Canoe Surf; proudly conﬁdent, they are usually in everybody's way until they have learned to look out for themselves and others. them on their boards, out through the surf, give them a shove and they joyously ride in on the small surf near shore, receiving many a thrill while their proud friends and relatives watch excitedly from the Moana pier and snap pictures of these surﬁng belles. Only about three mahinis (women or girls) have as yet become experts at this difﬁcult game, as it means hard work, tenacity of purpose and grit. Yet surely the gloriously exhilarating excitement and the proud feeling of doing the unusual will more than compensate for the work of learning how. If anyone is troubled with ennui or a liver, take up the fad of surf-riding and soon you will feel like one of the kings of the earth. Surﬁng is the best exercise for muscular development and a ﬁne exercise for competitive swimmers, as it develops the arms and shoulder muscles. Duke Kahanamoku, one of the world's greatest swimmers, owes his superb physical development to the fact that before he became a champion swimmer he used to almost live on his surf-board. The ideal place to surf is at Waikiki, Honolulu. While the surf in other places is not as ﬁne for surﬁng as in the islands, yet it is quite possible for this sport to become popular in other parts of the world. Duke Kahanamoku gave exhibitions of surf-board riding in Australia and also at Atlantic City, N.J.; which aroused great interest. Since then a few good swimmers have been trying it out in those places. In the States, along the coasts, the problems of surﬁng are very different from Honolulu. The surf must be studied and the weight and size of the boards experimented with. George Freeth, an expert rider from Honolulu, is the only one to ride successfully the California surf. Many times at Redondo Beach and other beach resorts near Los Angeles he has demonstrated that the surf in these places can be ridden. The average size of a board used at Honolulu is about eight feet long by two feet wide and two and a half or three inches thick, weighing from sixty to eighty pounds. at a point two feet back from the bow, and tapers to about eighteen inches at the stern. The upper part is flat and the under side rounded, being thickest just in front of the middle and tapers towards the bow and stern, at which points the board is from half an inch to an inch thick, being thinnest at the rounded bow. It is also rounded off towards the sides, leaving no sharp edges. These boards are made from sugar pine or California redwood. They are either shellacked or varnished with valspar, to keep them from becoming watersoaked. The ﬁrst thing you learn is how to paddle your board. This is mostly a question of balance. You lie on the board face down, being careful that the weight of your body is along the middle of the board. Have the nose of your board a little out of the water, then paddle with the over-arm, swimming movement, or better still, use both arms at the same time. Go out to where the water is deep and the surf is breaking with some "pep." There are several ways of getting yourself and board through the surf with least resistance. When you see a. wave coming point your board straight at it; hoe (paddle) as hard as you can, duck your head, and hang on, and through you go. When you encounter very big surf, the best way is to slip off your board to one side (never at the stern); grasp it with a hand on each side near the end, then just as the wave is about to strike you take a deep breath, duck under your board and shove it through the wave. By all means hang on, unless you are anxious for a long practice swim shoreward. Don’t try this way in shallow water. .
Where to surf and how to choose the right waves to ride in on is a matter of experience. Never try to ride a double wave. The waves roll in three or four at a time; the third is usually the strongest and will give one a longer ride providing one has the luck to ride it successfully. A novice should never try to ride the very big surf, as this is dangerous. While waiting for the waves, sit astride the end of your board. To guide it you paddle with your hands. If you don't wish to ride a wave, point your board shoreward, sit as far back as possible, and tip the board up a little, then the wave will go over you. One can lie on one's board and let the waves go over one in the same way. THE most difﬁcult part of surﬁng is learning how to get your board started on a wave, and to keep it going in the regulation way, without its turning a somersault or slipping off the wave. A mistake that a novice usually makes is to get too far back on the board when taking a wave. In getting a wave you lie straight on your board, feet together, then paddle as if your very life depended on it, as the board must have considerable momentum before the wave strikes it. Just as the wave reaches you—give a hard pull—then hang on and learn how to guide your board. This is done with the feet; use them as rudders. The idea is to keep the board straight before the wave. If you wish to go to the left, thrust your left foot out on that side, or right foot if you wish to go to the right. If the board threatens to bury its nose and dive under, raise your weight a little from the how, slow back on your board—too far back is dangerous, as the board might strike bottom and disembowel you. When your board dives under be sure to hang on. Never let your board get away from you, then there is no danger of its striking you if your arms are holding on to it above your head, which is the position you will ﬁnd yourself in when you duckunder, if you have hung on which both hands. It is fun to duck under, only it is considered greenhornish, and the expert surfers are apt to grin. It is dangerous to duck in big surf breaking in shallow water, unless one knows how. Relax and hang on, if you wish to do it gracefully. WHEN you have learned to ride lying down, and how to steer, then try kneeling, and guide the board by dragging your hand on the side you wish to go. In learning to ride standing up, be quick and have conﬁdence, as you can only fall off once each time, and you will anyway until you learn how to keep on the board. In getting up you hold on to each side, get into a crouching position, feet turned a little to one side and under you, then stand up quickly, just back of the center of the board, feet a little apart and body turned slightly to one side, arms close to the body if possible. After many falls, which never hurt in deep water, one soons learns how to ride standing. To guide the board, throw the weight of the body on the side you wish to go towards. If the board threatens to dip, step gently a little back on your board, or a little forward if you wish to keep it from sliding off the wave. Standing on a board is a question of balance plus conﬁdence. Surﬁng is not dangerous, unless one is careless. It is necessary to be quick in thought and action, looking out for possible dangers. In going out again after riding a wave. keep a sharp lookout for incoming surfers or runaway boards, and for canoes if surﬁng at Hawaii. If you haven't time to get out of the way, duck under your board and hang on; then if a board hits, it won't strike you if you are underneath. This is impossible in shallow water. 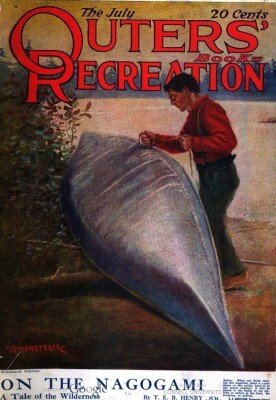 If a canoe runs you down, throw your board to one side away from the outrigger part, take a deep breath and dive directly under the bow of the canoe— if possible (all this must be done in about three seconds); hold yourself under by pressing along the bottom of the canoe with your hands until you feel the stern, then it is safe to come up. I well remember that I was almost speechless with joy the ﬁrst time I had to dive under a big canoe. As I came up, gasping but (Continued on Page 68) happy, Dad beamed his smiling approval. Another of the dangers is for a novice to take a big wave either before or just after the wave has broken. These waves are very steep and a ﬁerce ducking is inevitable. The only way one can ride the big surf is to slide, which is done by twisting one's board a little to one-side, away from the break of the wave, then stand up. The experts take the big surf before it breaks, slide and stand up at the same time, and by keeping away from the break they ride a long distance in the curl of the wave. This is considered the most interesting and exciting way to ride. In sliding it is better for a novice to turn his board, then stand up when he has it well under control. The Queen's Surf near Waikiki is the most difﬁcult. It is impossible to ride these nalu nui (big waves) unless one slides, as the combers are very high and steep. To have one’s picture taken at Queen's is the height of a surfer's ambition. There are many other points to be learned about surﬁng, which experience plus alertness will soon teach one. Geoff Cater (2017) : F. M. Davidson : Riding Old Ocean’s Waves, 1918.